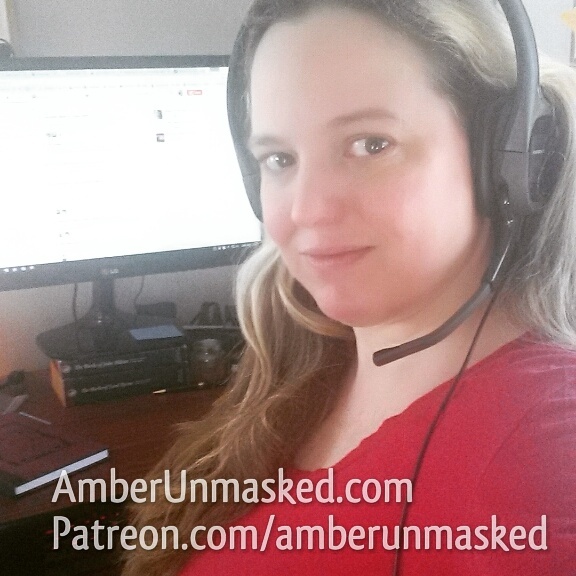 AMBER LOVE 03-NOV-2017 Posts like this are first read by the generous supporters at Patreon.com/amberunmasked. Consider adding to my tip jar so I can afford things like paying my car insurance and website expenses. Videos will be added to this series as they are released. Depending on what you’re feeling at any given moment would determine what kind of yogic poses would be beneficial. 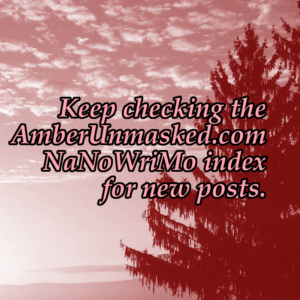 For this post, let’s assume you’re spending anywhere from 1-3 hours in a chair to write. I know that’s a generalization. Some people are great with writing 15 minutes here and there in between other tasks. If you fall into that category, I can provide some tips at the end. Yes, it’s filmed that awkward way of vertical instead of horizontal. Normally, I detest that it and it makes me cringe. In the cases of these videos, it seemed like the best option to make sure viewers can see from the floor to as high as I can reach without a ton of unnecessary side space (ie, my laundry and even more cat toys than you can see here). Because of the license agreement I have to use the music, I don’t get ad money from Google/YouTube. Mountain pose seems like the most basic thing to do, but when you focus your consciousness on your body instead of the outside world, you can discover how powerful and intricate standing tall is. Since it’s the foundation of all other standing postures (even seated postures from the waist up), it’s an ideal asana to incorporate. By standing tall and evenly balanced (left to right, front to back), the lungs and diaphragm have more space to move for better breathing. It can help you feel proper postural alignment which means you’re able to recognize slouching over at your desk and correct yourself. CNY Healing Arts also has an easy-to-follow post explaining how to do mountain pose and a long list of benefits. Like all asanas, there are a variety of ways to accomplish a pose. If you feel you have mobility concerns, there are options. Feel free to check places online like YouTube for tutorials on adaptive techniques. Since tree pose begins in mountain pose, the same benefits apply. Taking time to balance on each foot (even if you keep the toes of the other foot down) will additionally strengthen your leg muscles and glutes that you’ve neglected from sitting. It aligns the spine and can bring your awareness to your shoulder blades which you want to slide down your back. Keep your shoulders from shrugging up to your ears. Having the shoulder blades down and more relaxed can ease tension and help with breathing. Plus, balancing requires concentration. If you’ve reached a point in your story where you aren’t sure what to do, work on balances. The solution might come to you once you’ve taken that mental pressure off of yourself. Legs Up the Wall is one of my all-time favorite postures. I like to believe anyone can do it, even if that means having a helper to get in and out of the pose. There are always ways to do this in a restorative fashion with some props (I’ll leave that to you to research). Mostly, this is an asana in my toolkit for relieving menstrual cramps, but it’s good for all kinds of things like relieving tired feet and legs, moving the blood circulation a different way, reducing anxiety, and tending to headaches. It’s a basic pose for lower back pain too. One of the cool things about a pose like this is that if you open your eyes, you physically see the world a different way. I noticed this by playing with cats on the floor a lot. It changes the sensations of looking for the horizon to keep from falling down because you’re already down and safe. A lot of people are familiar with “cat/cow” even if they don’t go to a regular vinyasa class. Because here we are discussing a daily pattern of hunching at a keyboard or possibly improper posture at a standing desk, I think it’s best to focus on the cow pose rather than cat. It’s easiest to explain by pointing out that cat pose is on all fours and arching the back upward like a “Halloween cat” in drawings and cartoons and what Gus does when he’s startled (he looks hilarious by the way). Therefore, cow is the reverse. Starting in a strong neutral alignment, bellybutton pulls back to the spine inside the abdomen and is locked there. Begin movement at the tailbone by lifting it up to the ceiling tilting the pelvis forward (toward the floor) and continuing this gentle backbend one vertebrae at a time; only tilt the head back to what’s comfortable. Never over-extend any part of the spine. Slowly, one vertebrae at a time come back to a stable neutral tabletop or “box” pose. Moving in and out of cow and tabletop brings your spine into the reverse action of hunching over at a desk. 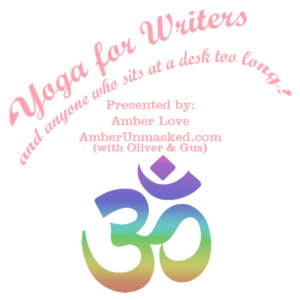 YOGA FOR WRITERS Part Two is now available. Learn about “Sadhana” and what it means spiritually in terms of making your art a daily commitment.